Winemaker’s Notes: Vilarnau Rose’ Delicat Brut Reserva is pale pink in color. Very intense, it offers great aromatic complexity. On the nose, it displays the primary aromas that are typical of delicate rose’ cava; subtle violets and roses in combination with ripe berries includes strawberries, raspberries, and blueberries. On the palate it is smooth, very creamy, fresh, and elegant. We recommend serving it as an aperitif or to accompany pasta dishes, pizza, paella and fideua. My Review: I already spent a bunch of digital ink talking about bottle design when talking about the Vilarnau Brut Reserva, so I won’t do that here as well. Suffice to say, that I dig the bottle design, and it alone would have probably gotten me to buy this bottle. We are, however, on to the wine. In the glass the wine showed as a deep pink color, which given Garnacha is the primary grape, makes sense to me. On the nose I picked up aromas of roses and raspberries. In the mouth the wine had nice small bubbles, making it very sippable. I got flavors of raspberry and cranberry. The wine itself was crisp and refreshing, something that I would love to sip on the patio on a hot day. My wife and I paired the wine with some black bean burgers we made in a Mexican style (lots of spice), and the wine did a nice job of balancing the flavors. I think anything spicy, or hearty (burgers, BBQ) would be a nice fit with this wine. 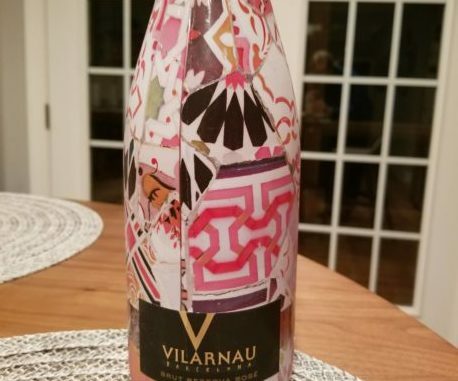 For $16 I really dig the Vilarnau Rose’ Delicat; it’s a good value for an enjoyable wine, and the bottle is a great conversation starter – when they were delivered to me at work all my designers wanted to do was talk about the bottle.